Brrrr! It's cold outside! 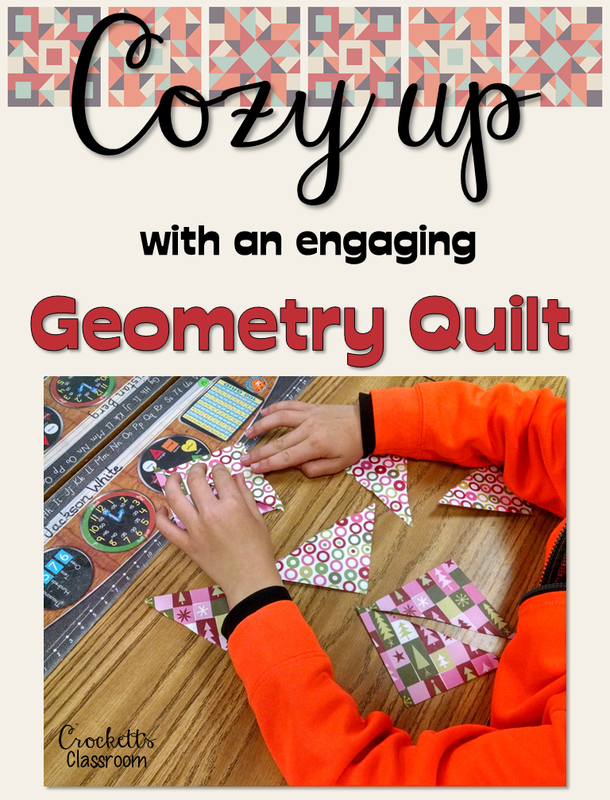 Time to get out the quilt and have a little fun with geometry. I have a great project that can be done with any geometry unit. 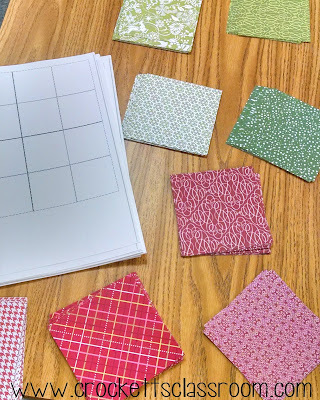 A few weeks ago I spent a couple of afternoons with a super class of second graders and helped them review some geometry concepts as we put together paper quilt calendars for the new year. 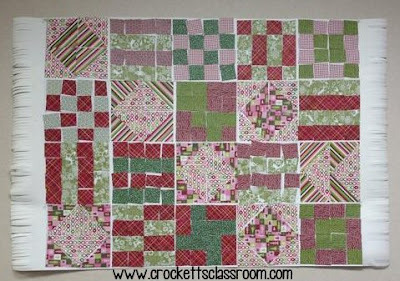 Before I started the lesson I cut 4 inch squares from some holiday scrapbook paper. 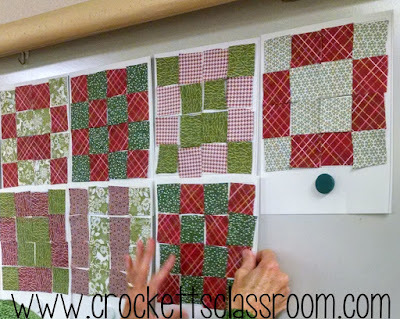 We did this project in December so I chose red and green paper, but you can do this with any scrapbook paper you have on hand. Let each student choose 4 squares, 2 of one color/pattern, 2 of another color/pattern. Then we cut the squares into rectangles and then the rectangles into smaller squares. 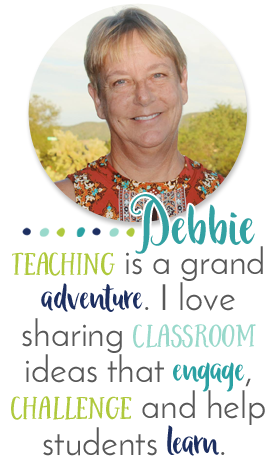 Each student should end up with 16 small squares. While we were cutting I was reviewing geometry terms. Now, let them explore making patters. I was arranging my own pieces on the board so they begin by making my pattern. But, they soon began creating their own patterns. After a little while I asked them to choose one pattern they liked the best and glue it onto the quilt back. 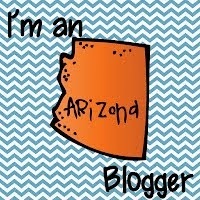 The results were beautiful! The next day I returned to their class and went through the same procedures but we used triangles cut from the squares. The kids made some amazing quilts! 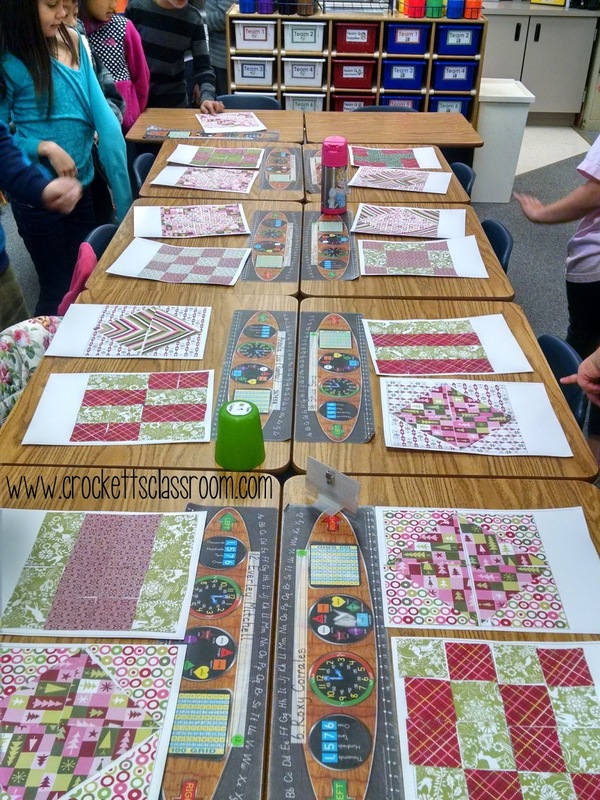 Since the students had created 2 quilts they got to choose one to turn into a 2016 calendar. The second one was put into a class display.